A great family day out for anyone looking to get away from the beach is to walk up the Rio Chillar in Nerja. 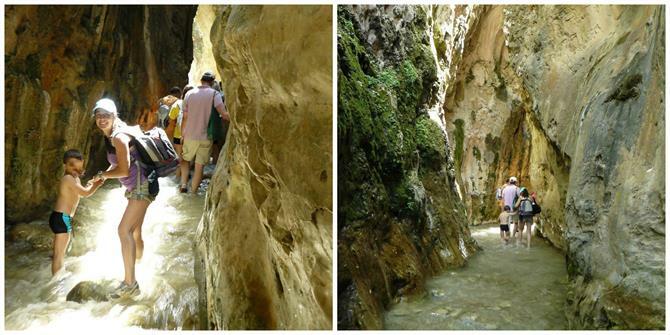 It is one of the few walks in the area, that is possible during the height of the Andalusian summer. 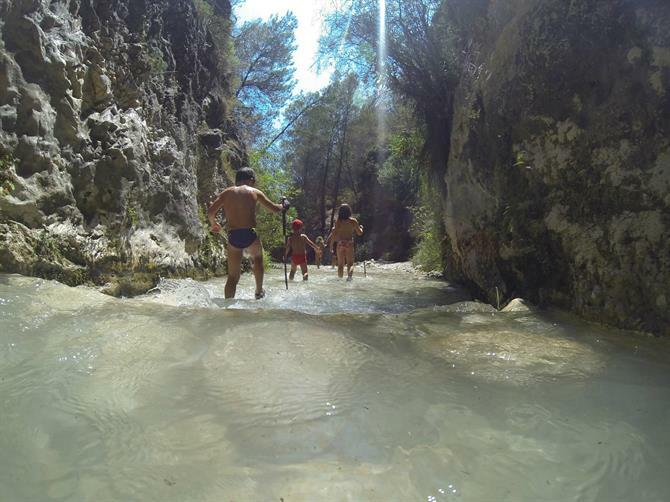 The route cuts through the Sierras de Tejeda, Almijara and Alhama Natural Park, offering plenty of shade, crystal clear river pools and guarantees a brilliant day out for the whole family. There's no better way to cool off on a hot summer's day. The Rio Chillar walk is considered by many Spanish families as 'a summer classic.' It can and does, get busy on weekends and local holidays. If doing the hike on a weekend, it is always best to leave early. What do you need to walk the Chillar river? The walk itself is straightforward. You only need a good pair of shoes (that you don’t mind getting wet), a picnic, water and sunscreen. As it's a linear route, you can turn back the way you came, at any point. A walking stick is also recommended. Wearing an old pair of trainers is best, some of the rocks can be slippery. To avoid blisters, use socks as well. Children love it. Splashing around in the water, spotting various insects and animals. Higher up, there are several larger pools, in which they can swim and jump around to their heart’s content. 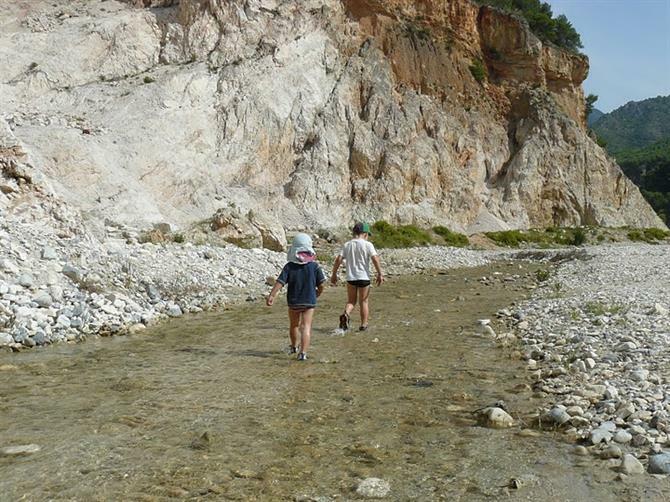 As with any river walk in Andalucia do not go near this area, if rain is forecast. Flash flooding is a very real and dangerous occurrence. Be prepared to cross the river many times and to walk within it. 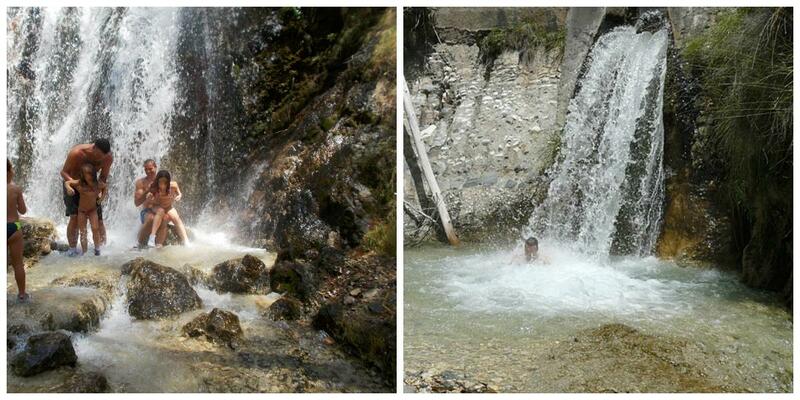 As you get higher up, there are numerous larger pools for swimming. People travelling with small children often find one of the quieter pools and stop there. If you carry further up the river you’ll eventually come to a series of waterfalls. Some of which, provide a fantastic natural massage! The walk up Rio Chillar is highly recommended. For the more adventurous Junta de los Rios – just inland from Almuñecar is one to try. There are numerous ways to get to the river bed. If going by foot from the centre of Nerja, the easiest way is to walk down to the river from the end of Calle de Joaquín Herrera, just behind the main bus station on Calle de Pescia. You can save a couple of kilometres and go by car. Drive through the centre of Nerja, going in the direction of the health centre and Burriana beach. There is a roundabout with a sign post for Verano Azul, go around the roundabout and take a right into the urbanization. Falling onto Calle de Julio Romero. Follow this road, it veers off to the right and goes upwards, becoming Avenida la Constitución. The road keeps climbing upwards, take the second turning on your left onto Calle Mirto. Its a sharp turning (with a field in front of you) and you’ll drop down onto a small urbanisation. Parking is feasible here. There is a small paid parking lot, but its often closed. It you want to get closer to the river. Drive through the urbanisation and follow the road upwards to the right. Passing under the motorway. You should see the river on your left. The concrete road dips back down towards the river and becomes a track. Keep following this track as far as you can. Parking has become more problematic in recent years. Previously people parked next to the large cement factory, this has now been blocked off. Park anywhere you can – more often than not, you’ll find parking on the road that leads down to the cement factory. Be careful to respect any no parking signs and entrances to houses. Cars are often towed in the summer months. The walk starts here. For the complete track. After this day trip you'll be ready to check out some more great family days out near Malaga. All of them have been tried and tested.......and come highly recommended! !